The Boston Celtics are somewhat of pioneers in the NBA. No, not for anything basketball-related on the court, they were one of the first to change a common area of the arena - the court itself. It has seen a lot of changes in the past few years, most noticeably the addition of two extra tables, along with additional courtside seats, and moving the announcers to their own table on the opposite side of the court. This new configuration is entirely centered around the television exposure of courtside advertisements. By having two new tables, one on each end of the court next to the team benches, courtside advertisements are able to be seen no matter where the action is taking place on the court. Whether the camera is fixed on the home teams' end, the away teams' end, or the center, courtside advertisements will be seen by the millions watching on television. These ads receive about 15 percent more exposure with the new configuration, and you can understand why other NBA teams have caught on to the innovative configuration. One of the most recent teams is Cleveland, who changed the set-up of their scorer's table this season. 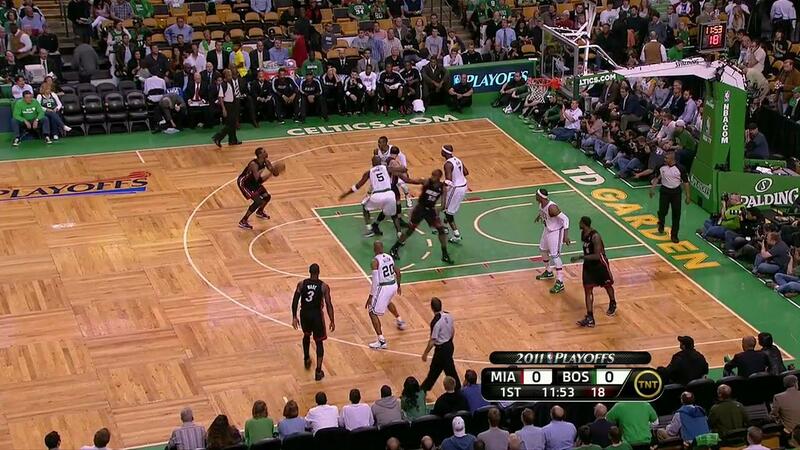 The next time you watch the Celtics on CSN, notice how often you can see the courtside ads. This increases the value their sponsors get from courtside advertisements, making this a growing trend all around the NBA.